Many home lawns struggle because of clay soil. While clay is an important part of healthy soil, too much can ruin soil. Red soil varieties are probably the most common, but there are other types and variations as well. Parts of Texas and Louisiana have thick, gumbo clay soils. (The name "Gumbo" is a fitting name for the heavy sand-clay soil) It is not easy for plants to become established, but once they do, they often do well. Home builders are notorious for stripping away the topsoil before building begins. If the home has a basement, the lot is very often covered with the excess clay that was removed during construction. What good soil exists is covered with clay. The photo to the right shows red clay from basement construction spread over the topsoil. Although you can see a small patch of good soil showing through, the majority of the planting surface is now clay. A certain amount of clay in soil is not a bad thing. Clay has excellent water holding capabilities and can be very fertile. However, the problems of excessive clay can easily outweigh the benefits. 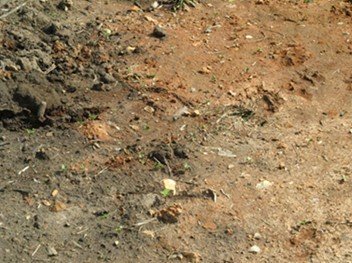 Below are a few problems associated with clay soils. Clay can be very difficult to penetrate making it hard for roots to become established. Clay soil tends to be alkaline, which makes iron less available to plants. Clay compacts easily reducing the amount of oxygen to the roots. Clay can absorb and trap water for extended periods. Clay can also cause puddling and drainage problems. Clay can become rock hard when dried. Organic matter is still the best choice for improving clay soils that are not planted with grass. A common misconception is that a little organic matter spread over the surface will fix most problems. If it were only that easy, but it is a start. The information below will help you visualize actual percentages. It is not a bad idea to find out how much organic matter is already in the soil. Submitting a soil sample to be tested will give you that information as well as the nutrient levels. This link will help you understand how to conduct a Soil Test. After you receive your test results, come back here for help interpreting the Soil Analysis Report. The average soil test indicates that most lawns have between 2% and 6% organic matter. Many researchers agree that 5% to 6% is ideal for most lawns. Topsoil is generally considered to be the top 6 inches of soil. This is the maximum depth many soil tests are based on. If a soil tests indicates you have 2% organic matter in your half acre of topsoil, that would equal approximately 20,000 lbs (twenty thousand pounds) of organic matter. To increase the amount of organic matter by only 1% would require 10,000 lbs of organic matter spread over your half acre. To bring it to 6% would require 40,000 lbs of organic matter. If your lawn is one quarter acre (.25 acres) in size, simply divide the pounds of organic matter listed above by 2. For example, it would take 5000 lbs (five thousand pounds) of organic matter to increase the level of organic matter from 2% to 3%. The organic matter amounts listed above is a lot more than people think. Obviously, it is generally not practical to apply that much at one time. If you have poor soil, the best way to incorporate the amount of organic matter needed to truly improve your soil will require a roto-tiller to work it in. Important Note: Do not roto-till clay after a heavy rain because it will destroy the clay structure, further compacting the soil. Wait until the soil has had time to dry. An easier method, if possible for you, is to simply apply 6 inches of quality topsoil over your existing clay soil and plant your lawn in that. Be sure you prepare and level the site before planting. This can be tricky. It is not legal in most places to raise the level of your lawn that causes water to drain onto a neighbor's property and you don't want the water to flow back toward the house. Proper planning and grading is essential. If you already have an existing lawn, you will need to apply organic matter by a process called top dressing. (Also spelled as "topdressing") Top dressing is generally performed once or maybe twice a year in some cases. When topdressing you apply a thin layer of organic matter over your grass. Applying a layer of 1/4 inch to 1/2 inch thick usually works best depending on the mowed height of the grass. Up to 1 inch may work for grasses maintained at 3 or more inches. If you completely cover the grass with compost photosynthesis may be hindered and the grass will suffer. It is usually a temporary affect. For the organic matter to do any good it needs to be worked down so it touches the soil. Brushing the grass with the backside of a rake is usually enough. While top dressing is extremely beneficial at every stage, it may take several years before you would be able to increase the soil organic matter to a satisfactory level. Click here for more information about top dressing a lawn. It helps greatly to core aerate the lawn before topdressing. Core aeration pulls out a plug of soil approximately ¾ inches wide by 3 inches long. Pass the aerator over the grass several times in different directions. It will seem like you are over-aerating, but you are not. If the soil is largely clay, remove the cores before topdressing. Once you begin top dressing, allow the organic matter to fill the holes. This gets the amendment down into the soil instead of only on the surface. There are a few companies that specialize in top dressing lawns, but not many. Rental equipment designed to spread organic matter on lawns is just as difficult to find. Using a wheel barrel and a shovel to scatter a thin layer is still the most common method used. There are a number of natural soil amendments on the market that claim to help relive clay soil compaction. Some products work well, while others don't. Turface is a product developed by the professional sports industry for use on baseball fields to relive compaction, absorb excess moisture after rain, and to help airify the soil. It is available for home lawns and gardens as well. It is a product that has proven itself and is now used in nurseries, container plants, vegetable gardens and even in the bottom of fish tanks. It is best when blended into the soil, but some products are designed to be broadcast on the surface. Humic Acid is also used to relive compaction. It is a term that describes the bio-chemically active ingredients of humus and is derived from many decomposed organic materials. In the U.S., the best sources of humic acid is found in coal around Arizona. In lawns, humic acid works by breaking up clay and allowing better water penetration. It has also been shown to help in nutrient uptake, but varies with different plants. It helps with water retention in sandy soils as well. Do not use sand to blend into clay soil as an amendment. Even though it is given as advice in some articles, it can have an opposite affect by making the clay rock hard and almost impossible to work with. For sand to be effective, use the largest coarse sand particle size available. Finer sand particles can fill the tiny holes in clay structure producing something like concrete. Sand based soils have sand volumes at least 50% of the volume of clay. To produce your own sand based soil you would need a tremendous amount of sand for a home lawn. Unless you are an expert, it would be best not to try it. Sometimes fixing clay soil requires extensive work removing the surface soil and replacing it with quality topsoil. We have provided some important tips and advice to consider. Lawn Moss is a common problem in many yards. However, its presence is also a sign of deeper soil problems that need attention. Find out what lawn moss is and what needs to be done to get rid of it. Soil Microorganisms are essential for all plant life. Click here to learn about the different types of soil microbes, the conditions they are most active in and the best ways to stimulate them. Salt is an important element for plant life. However, excessive salt not only destroys the soil structure, salt also attracts water and blocks its absorption to plant roots. Find out how excessive sodium gets into soils and how to fix it.